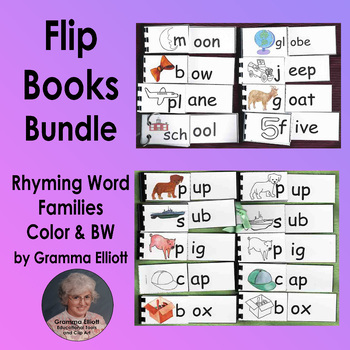 Word Family Flip Book Bundle helps students learn words through rhyming word groups and initial blends and digraphs. This large package includes flip books from 135 word families and 27 blends and digraphs in color and BW. This high quality teaching tool requires time to assemble. I find that some older students or a volunteer parent can help, and I often assemble a few at a time. Instructions for assembly are included in the file. Obviously, significant time for assembly is required. Assembly of the entire package may take 4 hours, however, booklets can be separated and assembled one at a time in less than 5 minutes each. The comb binding machine does a very nice job on these books, but book rings and yarn binding works nicely. “Rhyming Word Family Flip Book Freebee (k-1-2)”. Please download and test these before purchasing this very large package of flip books. If you have any questions or suggestions, you are welcome to contact me through questions on TPT or my email at GrammaElliottCreations@gmail.com.